In the new "Staging Diva Sales Script: How to avoid the f/ree estimate trap & turn homeowners into home staging customers in one phone conversation" you'll learn exactly what I say to potential customers. I've set it up so you can read word for word what I say when someone calls and says, "I'm thinking of having my home staged, what does it cost" or "I'm thinking of having my home staged, can you come a do a f/ree estimate?" If you handle those questions right, within 20 minutes you'll be booking a paid meeting even if the person has never met you in person before and even if your rates are higher than the competition. I used this script to go from no business to over $10,000 a month within my second year staging homes. This script will help you at least double the number of customers who hire you from the ones who call. 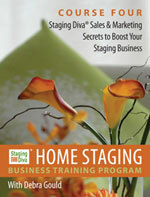 The new Staging Diva Sales Script is available right now at the introductory price of only $59. If you got only one new client from what you learn with this script, how much is that worth to you? Learn more. Don't take home staging training just because you want "credentials" since there are none (not official ones at least). Notice I'm one of the only people offering a training program that tells you this. I could have made up fake letters to put after your name too, it's just not how I choose to do business. Decide exactly what you need to get out of a program and then find training that offers that. Compare course content carefully and see which one covers what you need to improve your chance of success. Since this is a completely unregulated industry anyone can start up a training program whether they've ever worked as a stager or not. I've prepared a list of 15 questions you should ask before handing over your hard earned c@sh. Looking at the photo of me with the drill and tulips you'd probably guess those are my favorite tools. Actually they come a close third and fourth. The most important staging tools a home stager has (other than their innate talent) is a measuring tape and paint swatch book. Don't make the mistake of getting one of those small, light, easy to carry measuring tapes or those fancy new laser ones. You need a good old fashioned contractors-grade tape measure. It's bulky and usual neon colored (so they can find it in the drywall dust I guess), but it does the job. While I can walk into a room and almost instantly know if the furniture is in the wrong place or it's the wrong size, I do rely on my measuring tape to help me decide how to move it all around. Don't leave home without it! My second essential tool is my paint swatch designers kit. Not only does it contain 2500+ colors, it gives me larger samples of each. I recommend paint colors in many of my home staging consultations, plus many of my clients want me to pick colors for their new home. Learn how I recommend colors, my favorite choices for every room in a house and how to get your own Designers Kit. With kids almost off school and summer schedules breaking up the usual routine, now is the perfect time to think about whether your summer will allow you to set aside two hours here and there to listen to the Staging Diva course recordings. If you do, you'll be in excellent shape to launch and/or grow your staging business this Fall. Whether you are new to the field or your business isn't growing quite as you had hoped, I can help you. With five courses to choose from, you can take them all at once or hand pick the ones that you feel will fill in the gaps of what you need to know. Learning from home cuts your costs and time commitment. And did you know that I am the only person teaching home staging in the whole world who has a Masters degree in Marketing and has actually built a successful home staging business? With course recordings and study notes that are emailed to you right after you order, you get to listen to the material as often and whenever you like! If you order before July 1, you can sa.ve. $50 per course or over $100 on the whole program. Still waiting for the full page National Post feature on me as the cover story in their Saturday Home Section. If I knew the date I'd tell you. Every weekend I wake up thinking "is today the day?" This Old House Magazine, is running their staging story in the July/August issue, on news stands in June. With a circulation of over 6 million, this will generate projects for Staging Diva Graduates who are part of the Directory. Home Business Magazine is featuring me in their October 2008 issue. Entrepreneur Magazine will feature Staging Diva in the Fall 2008 Business Start Up Guide. 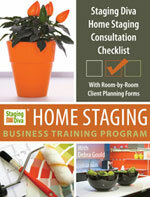 Staging Diva is the only home staging business opportunity included in all of their guides for three years running. The Decorating Adventures of Ambrose Price is in final editing for HGTV, airing this fall. In one episode I take Ambrose under my wing and teach him all about home staging. Then he does a condo on his own and I'm brought back in to judge his work. Stay tuned to see what I said when he asked me to hire him. The Better Homes and Gardens staging story is still waiting to go to press, though they tell me it will run. I hope so! Not only did they interview me, they insisted on also interviewing my clients. I'd hate to think I asked them to speak with the reporter for nothing. Read more about Staging Diva in the News. Peggy, our Manager of Operations supervises several others behind the scenes. Sandy is my Executive Assistant who does a great job of answering questions, keeping the Staging Diva Network humming, ensuring Graduation Certificates go out in a timely fashion and many other behind the scenes details. I couldn't run this business without her. Email Sandy when you need help! I'm still accessible but with over 500 emails a day, I need help! If you ask Peggy or Sandy something directly that they feel needs my attention, they always forward your message to me. 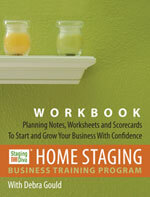 I've been blown away by the response to the new "Staging Diva Home Staging Trainng Program Workbook: Planning Notes, Worksheets and Scorecards to Start and Grow Your Business With Confidence." The worksheets and exercises it contains are all based on the training in the Staging Diva Program, but having a fill-in-the-blanks guide to complete the program homework and action steps is really helping students stay organized. This workbook is available to everyone, but remember it's a workbook, not the whole 10 hour training program. If you want the thinking behind all the exercises it includes, you need to be a Staging Diva student and take the courses this workbook is based on. 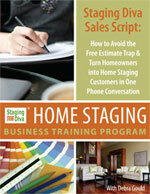 I'm really excited about the new Staging Diva Sales Script. It was inspired by Carla Savko (CA) who said she used the learning from course 3 to land her first client. She had taken notes on my detailed explanation of to handle a sales conversation, but it got me thinking how much easier it would be for my students if I wrote out the whole script I use word for word. Learn more in the sidebar story at left. HGTV is putting the finishing touches on the new "Decorating Adventures Show" I taped with them. I have no air date yet, but they asked me to send my logo for the film credits, so that's a good sign! You can read more in this issue about upcoming media coverage. I hit a personal milestone this month with 800 Graduates of the Staging Diva Training Program worldwide. Proving that home staging is not a local phenomenon, we have our first Staging Diva Graduates now in Brazil, France and Spain (joining the United States, Canada, England, Wales, Portugal, South Africa, Barbados, Australia and New Zealand). Let's face it, every homeowner in the world wants to make as much m0ney as possible from their real estate transactions. They can't do it without the help of home stagers. I hope you find the content of this issue of Staging Diva Dispatch helpful. I welcome your opinions, success stories and/or new story ideas; it's a challenge deciding what to write about month after month! P.S. If you missed the May Preview session, you can listen to a recording here. 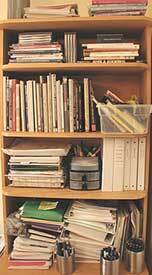 Don't neglect shelving units and book cases when staging. They contribute to the overall look of a room. Here's what I did in a cluttered home office. As Staging Diva students know, I advocate spending time on staging all visible shelves in a home. This includes the china cabinet too, which I typically empty and rearrange during an initial consultation. If a book case is over stuffed, it makes the room look smaller and disorganized. 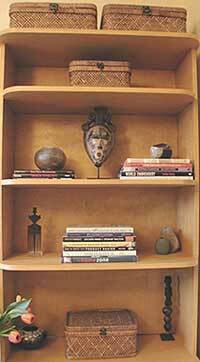 Break up the books with decorative items and let the back of the shelving unit show through. Depending on the depth of the piece of furniture, this can make a room feel up to a foot wider. In an initial home staging consultation I'll start the process so the client can see the transformation. It helps them realize how much better the room can look and they see that they wouldn't be able to style it themselves the way I'm doing it. Many let me finish the whole thing right then, others want me to come back when we have more time. 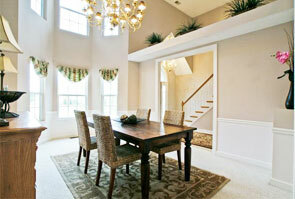 The goal of home staging is to help prospective buyers fall in love with the home and imagine themselves living there. Home offices are often key and it's important to encourage your clients to put away as much of their office stuff as possible, even if it's a working home office, as shown in my before and after photos above. For more tips on what to do during a home staging consultation and how to make your suggestions so that the client isn't offended or defensive, check out course 3 of the Staging Diva Training Program, "Taking the Mystery Out of Home Staging Consultations." For a step by step guide as you go through the home with a fill in the blank report you can leave with your clients at the end of your staging consultation check out Staging Diva Home Staging Consultation Checklist with Room by Room Client Planning Forms. Note: This product is f/ree when you order course 3 of the program! It's normal for fears to come up when you think about stepping out of your comfort zone to start your own business, or tackle a new challenge. This still happens to me and I've been supporting myself as an entrepreneur since 1989. The trick is to not let these fears paralyze you and stop you from taking action. Everyone gets scared, the difference is successful people keep going anyway. I make a two column wide chart and list all my biggest fears in the left column and on the right I write the worst thing that could happen if that fear is realized. Somehow doing this takes the emotional charge out of it, especially when I realize that usually the worst that can happen is "I'll feel dumb" or "I'll have wasted some time." Then I make a separate chart at the bottom and fill in "Possible solutions or places I can go for help." The idea is to put your focus on solutions instead of your fears. If you've read anything about the "law of attraction," you'll know what I mean. By focusing on solutions, you can start to take action and stop letting fear hold you back. This is an example of one of the hundreds of exercises in the Staging Diva Home Staging Training Workbook which contains fill-in-the-blank charts for you. The Staging Diva Directory of Home Stagers is into it's third year of winning projects for Staging Diva Graduates and I've made it even better than ever with a whole new look and structure. While I've invested over $3,000 in these improvements, I haven't raised the cost of participation because I want as many Staging Diva Graduates as possible to be able to participate. I recently did a coaching session with two stagers who were ready to close their staging business after only 90 days because they believed there was no demand for staging in their city. 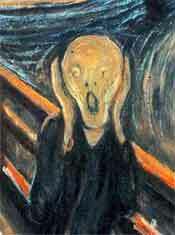 They wasted over a thousand d0llars on door to door flyers and a newspaper ad with nothing to show for it. One of the many problems with this approach is that these are one-time events which are easily missed and mostly reach people who aren't on the market for your services. These business partners didn't have a website and admitted to me that if a local home seller was looking for staging help, they would have no way of finding them. So how could they conclude there was no demand for their services? What a shame to be ready to give up their dreams within three short months, after spending over $1000 on marketing tactics that were doomed to fail. The handy search box in the Staging Diva Directory of Home Stagers makes it easy for visitors to find you! I have built my staging business, Six Elements Inc. and my training company Staging Diva, largely from my websites so I know how to make these work. That's why I created the Staging Diva Directory of Home Stagers; I want my graduates to be able to build their businesses 24 hours a day and 7 days a week and not waste their limited resources on marketing tactics that won't work. The Staging Diva Directory of Home Stagers lets you be part of a recognized and respected website that I'm spending time and m0ney driving traffic to. As anyone who has their own site knows, getting traffic to your site, is a much bigger challenge than just building it! Whether you have your own website or not, you can be part of the Staging Diva Directory of Home Stagers as long as you're a graduate of the training program. If you have your own site already, being part of the directory will exponentially increase your chance of being found because your profile on the Staging Diva Directory will link to your own site. Participants who have their own sites, generally report that over half the traffic to their own site comes from their link in the Staging Diva Directory. If you don't have your own site, being part of the directory will take the pressure off you to design, build and host your own site. This is time consuming and expensive when you do it yourself or hire someone else. When you're part of the directory, you just send us your copy and photos and we do the rest for you! And, if you have your own domain name, you can forward it to your profile page on the Staging Diva Directory. That way, you can put www.yourcompanyname.com on your business cards right away and your visitors will end up at your page on the Staging Diva Directory. That's what Leah Fritz has been doing for over 2 years now and she's got more business than she can handle! Don't fall into the same trap as the business partners I described above. It's worth considering how much business you are losing when potential clients can't find you. Only one staging project will more than pay for your directory listing for a whole year, and probably your training too! Learn more about how to join. Congratulations to Staging Diva Graduate and Directory member Leah Fritz of Perfect Place Home Staging (WI) on her upcoming feature in the July issue of Milwaukee Magazine and on her recent contract to stage over $2 million worth of real estate for a local builder! You can follow Leah and other graduates' ongoing challenges and triumphs in Staging Diva Dialog. Congratulations to Staging Diva Graduate Nicole Hurst of Cole House Design (ON) on so much business success within such a short time of completing the Staging Diva Training Program. "I have received many inquiries about my services from my page on the Staging Diva Directory since joining in March. The last call was from a homeowner who had a 5000 sq.ft. house. Without the directory she would have never found me, and I wouldn't have been able to stage this massive home. Thanks again Debra!" Is this not a stunning dining room? Staging Diva Graduate Gary Baugher, An Eye 4 Change (IN), always does such a beautiful job and then makes sure he's got the right portfolio photos to showcase his talents. I love how he dealt with the high ceilings and awkward area over the entrance to this room. Gary is also an active member of Staging Diva Dialog and has been generously sharing what has worked in marketing his business with the group. I'm so proud of Elizabeth Freeman of Staged Designs who completed the Staging Diva Program last spring. She's featured in a fabulous 5-part TV news feature on WGME 13 News in Portland, Maine. The story follows how Elizabeth, and a landscaper and painter transform a house that's been sitting on the market for over a year in a slow real estate market. She writes, "It was an exciting project and a fantastic way to showcase my business. I was so pleased with the results. Now my kids seem to think my job is on TV!" I'm sure if you told Elizabeth she'd be the star of the local TV news a year ago, she never would have believed it. That's the beauty of following your dreams, when you do ANYTHING is possible. I asked Elizabeth whether the Staging Diva Program helped her and she said, "I did a lot of searching before I decided to take the Staging Diva Program. I knew I had decorating skills, but where I really needed help was in the business side. Your program gave me what I needed to really get my business off the ground, as well as providing a source of inspiration. I didn’t have a huge budget and didn’t want to travel for training. The course recordings allowed me listen to the training on my own schedule with the option of listening to them again in the future. I also appreciated that I could get more assistance if and when I need it, and the support of the many Staging Diva graduates." Serving: West Los Angeles, Santa Monica, Brentwood, Malibu, Pacific Palisades, Beverly Hills, Hancock Park, Culver City, South Bay and Marina Del Rey. Serving Florida: North Broward County, Parkland, Coral Springs, Deerfield Beach, Coconut Creek, South Palm Beach County, Boca Raton, West Palm Beach, South Boca, South Palm Beach and North Broward. Serving: Shawnigan Lake, Cobble Hill, Mill Bay, Duncan, Crofton, Ladysmith, Malahat, Langford, Colwood and Victoria, BC. Learn how you can join the Staging Diva Directory of Home Stagers. Staging Diva Students and Graduates, send me your successes so we can celebrate your triumphs and inspire others! PLUS, being included in this newsletter gets you a F/ree home on my newest website. I also feature Graduates in my blog as you've seen from the stories above about Elizabeth Freeman and Gary Baugher. Google indexes those stories the same day I post them, which is excellent F/ree publicity that I give you (but you have to do your part by sending me information I can use)! The more links I provide you with, the better for your business growth.